The Mercury-bound MESSENGER spacecraft captured several stunning images of Earth during a gravity assist swingby of its home planet on Aug. 2, 2005. Several hundred images, taken with the wide-angle camera in MESSENGER’s Mercury Dual Imaging System (MDIS), were sequenced into a movie documenting the view from MESSENGER as it departed Earth. Comprising 358 frames taken over 24 hours, the movie follows Earth through one complete rotation. The spacecraft was 40,761 miles (65,598 kilometers) above South America when the camera started rolling on Aug. 2. It was 270,847 miles (435,885 kilometers) away from Earth – farther than the Moon’s orbit – when it snapped the last image on Aug. 3. 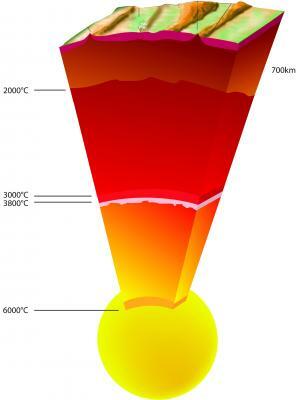 Scientists have determined the temperature near the Earth’s centre to be 6000 degrees Celsius, 1000 degrees hotter than in a previous experiment run 20 years ago. These measurements confirm geophysical models that the temperature difference between the solid core and the mantle above, must be at least 1500 degrees to explain why the Earth has a magnetic field. The scientists were even able to establish why the earlier experiment had produced a lower temperature figure. The results are published on 26 April 2013 in Science…. The Earth’s magnetic field is more permeable than previously thought, according to researchers analysing data from the European Space Agency’s Cluster mission. The findings have implications for modelling the dangers posed by space weather and could also help us better understand the magnetic environments around Jupiter and Saturn. The Cluster mission, launched in 2000, comprises four identical satellites flying in a tetrahedral formation in close proximity to Earth. With highly elliptical orbits, the satellites are able to sweep in and out of the Earth’s magnetic environment, building up a 3D picture of interactions between the solar wind and our planet. The solar wind is a stream of charged particles from the outer layers of the Sun blowing into the solar system. The Earth’s magnetic field is thought to form a protective barrier against it. It is well known, however, that if the magnetic field of the incoming solar wind has the opposite orientation to the Earth’s magnetic field, then the field lines can break and join up again in a process known as “magnetic reconnection”. This process allows the plasma from the solar wind to breach the boundary of the Earth’s magnetic field – the magnetopause – where it can then potentially reach our planet…..
Landsat has been collecting data of the Earth’s surface since 1972. Some of the images are visually striking, and they have been selected for the “Earth As Art” collection. These are the best. A series of Landsat satellites have surveyed the Earth’s surface since 1972. In that time, Landsat data have become a vital reference worldwide, used for understanding scientific issues related to land use and natural resources. However, some Landsat images are simply striking to look at – presenting spectacular views of mountains and valleys, forests and farms. To celebrate the 40th anniversary of Landsat, the US Geological Survey and NASA asked for your help in selecting the top five Earth As Art images. Watch as this NASA animation shows the sun blasting out a giant explosion of magnetic energy called a coronal mass ejection and the Earth being shielded from this by its powerful magnetic field. The sun also continuously showers the Earth with light and radiation energy. Much of this solar energy is deflected by the Earth’s atmosphere or reflected back into space by clouds, ice and snow. What gets through becomes the energy that drives the Earth system, powering a remarkable planetary engine — the climate. The unevenness of this solar heating, the cycles of day and night, and our seasons are part of what cause wind currents to circulate around the word. 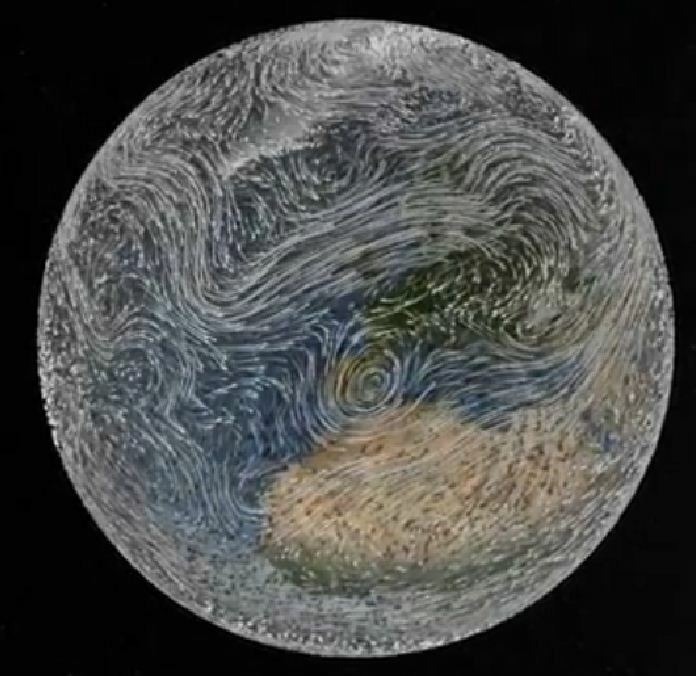 These winds drive surface ocean currents and in this animation you can view these currents flowing off the coast of Florida. This animation connects for the first time a series of computer models. The view of the sun and the Earth’s magnetic field comes from the Luhmann-Friesen magnetic field model and two models that incorporated data from a real coronal mass ejection from the sun on December 2006. NASA’s Community Coordinated Modeling Center (CCMC) at Goddard Space Flight Center, a multi-agency partnership that provides information on space weather to the international research community, generated these two models. 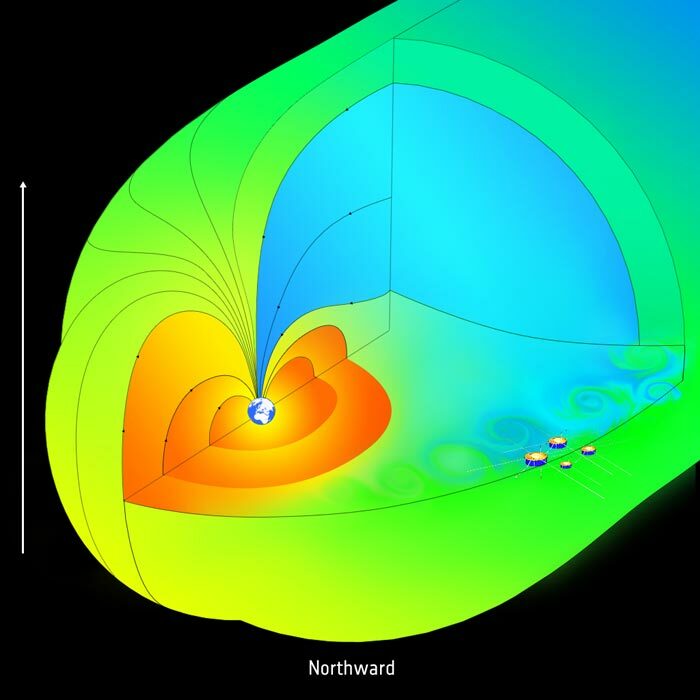 The ENLIL model is a time-dependent 3-D magnetohydrodynamic model of the heliosphere and shows changes in the particles flows and magnetic fields. The BATS-R-US model is also a magnetohydrodynamic model of plasma from solar wind moving through the Earth’s magnetic dipole field. It uses measurements of solar wind density, velocity, temperature and magnetic field by NASA’s Advanced Composition Explorer (ACE) satellite, which launched in August of 1997 and the Solar Terrestrial Relations Observatory (STEREO), two satellites that view the structure and evolution of solar storms. The view of the Earth’s atmosphere comes from the Modern-Era Retrospective Analysis for Research and Applications (MERRA), a computer model that uses data from the Goddard Earth Observing System Data Assimilation System Version 5 (GEOS-5) and incorporates information gathered from ground stations, operational satellites and NASA’s Earth-observing fleet of satellites. The model for the ocean is the Estimating the Circulation and Climate of the Ocean, Phase II (ECCO2), a joint project of the Massachusetts Institute of Technology in Cambridge, Mass. and NASA’s Jet Propulsion Laboratory in Pasadena, Ca. It is much easier to get to Mars than to get deep inside this planet, so for all our knowledge about things like earthquakes and the magnetic field, Earth’s interior is actually very poorly understood. To study how metals interact at the prodigious pressures within, scientists squeeze small particles in the lab and heat them up — but this is an inexact science and difficult to do. A newly revamped X-ray beam facility in Europe may be able to improve matters, and shed some light on just what is going on at the center of our planet. The European Synchrotron Radiation Facility inaugurates its new ID24 beam today, in preparation for experiments next spring. It will enable scientists to exact extreme pressures and temperatures on metals, aiming to understand how they act at Earth’s core. It will also be able to study new chemical catalysts and battery technology, among other atomic reactions. A synchrotron is a type of particle accelerator — the Tevatron is one — that can be used for a wide range of applications. One such application involves harnessing the accelerated particles’ electromagnetic radiation for scientific imaging. Synchrotron light sources use a series of magnetic fields to bend this radiation into different wavelengths of light. At ESRF, beamlines branch off from the particle acceleration ring to capture the particles’ (usually electrons) radiation. The new beamline, ID24, will enable incredibly fast X-ray absorption spectroscopy. 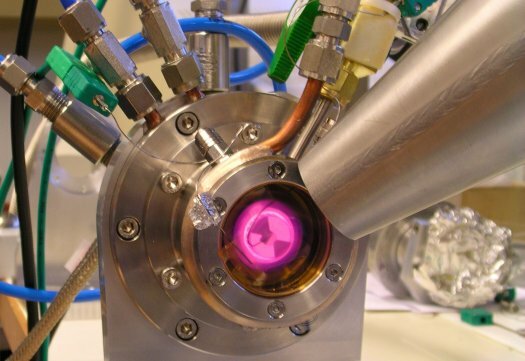 This works by firing an intense X-ray beam at a sample, and watching how atoms of the different elements inside the sample absorb the X-rays — it’s an active probe, monitoring its own experiments. The beamline has an array of germanium detectors that can take 1 million measurements per second, according to an ESRF news release. So scientists could take a small sample of iron, put it in the beamline, heat it to 10,000 degrees, and watch what happens. This would conceivably help scientists understand how iron behaves 1,500 miles beneath the surface of the Earth, and what are the melting points of other metals present in the mantle and core. This, in turn, could shed some light on things like Earth’s dynamo, which creates its magnetic field. The ID24 beam is the first of eight new beamlines at ESRF, part of a $245 million (180 million Euro) upgrade.